Do you ever find a recipe for something simple that just blows your mind because it's done so well? That how I feel about the Perfect Pot of Rice recipe from Bon Appétit, which is hands down the best technique I've ever used for making rice at home without a rice cooker. It's another great example of how the conventional wisdom isn't always right. So let's talk about that conventional wisdom: Most recipes for boiling rice will tell you to employ a 2-to-1 ratio of water to rice, so, typically, you might use 2 cups of water for 1 cup of dried rice, resulting in about 3 cups of cooked rice. For flavor, you might add a little butter, salt or both. Bring the mixture to a boil, cover, reduce heat to lower and cook on a low simmer for about 25 minutes. Uncover and fluff with a fork. The results are fine, but never really great. There's usually a little moisture left in the bottom of the pot. The grains are cooked but a little soggy. It works fine as a base for a stir-fry, but it's not something you'd probably want to sit there and eat by itself. This rice I could eat all day. The texture was perfect. Toothy, like al dente pasta, but definitely cooked through. Not at all soggy. Not "sticky" like Chinese rice either. It was really quite impressive. 1. Add ingredients in a 2-3 quart heavy saucepan that has a tight-fitting lid and swirl to combine (do not stir). Turn on the heat and bring to a boil. Cover pot, reduce heat to low and cook for 18 minutes (do not remove lid during this time). 2. Remove from heat. Uncover and place a clean kitchen towel over the the pan then recover (so the towel acts as a barrier between the lid and the rice in the pot). Let rice stand covered like this for 10 to 15 minutes. Remove lid and towel and fluff rice with a fork. Serve immediately or refrigerate for later. 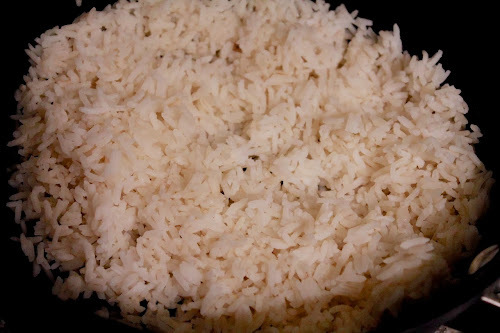 Now that you've discovered this preparation technique, will we be eating rice more often? I sure hope so.